Summer on the Short Bus might be short, but it packs a punch with its message. 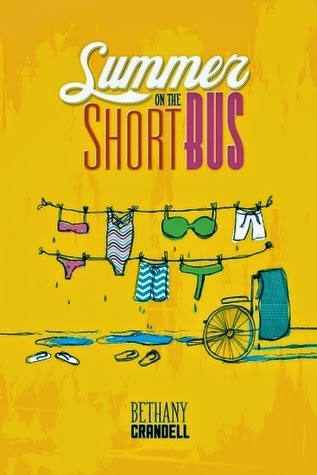 Without sounding preachy, although it did wind up being a tad bit cliché, Summer on the Short Bus is a decent addition to the contemporary novels that touch on sensitive issues. In this case, it focuses on the perceptions Cricket has of handicapped and special needs people – thoughts that, admittedly, many of us have had at one point or another. Crandell writes with a candidness that caught me off guard. Her raw honesty really comes to life in her main character Cricket, who is completely irreverent and definitely not politically correct. She has opinions on the kids that she encounters at the camp she’s forced to be a counselor at, and she doesn’t really make an effort to censor them. Instinct immediately called me for to be angry at how unfair and judgmental her thoughts were; but after much thought, it’s admittedly (1) a part of her personality and (2) thoughts that I too might have had at some point in my life. That’s really the beauty of Summer on the Short Bus. Cricket might not be the most favorable of characters, but she represents a part of most of our personalities – the part we don’t really like admitting to having. While I’m sure majority of us, me included, strive to be kind and non-judgmental, it’s not really a secret that we sometimes jump to conclusions or form opinions based on appearances. Seeing this play out in a novel was both refreshing in its unexpectedness, and a challenge to not be afraid to admit that sometimes, these thoughts cross our minds. Honestly, in the end, it’s about how you choose to react to these thoughts. Will you let them keep you imprisoned in your little judgmental box? Or will you learn from what you experience, especially if you have an opportunity like Cricket’s? You’ll have to read the novel to find out what happens to Cricket precisely. But I can assure you that any changes that happen to her feel true to her character, and pretty darn believable. While I was pretty entertained and loved that it made me think, I do also believe that Summer on the Short Bus might have benefited from a tad more character development. And by that, I’m referring to the characters apart from Cricket! I’d have liked to know more about some of the campers and other counselors. I also feel like, while there were a lot of incidents for reflection, none of them really hit that emotional home run that I was hoping for. Summer on the Short Bus is short and straight to the point. Cricket might not be likable, but she’s definitely a representation of some real thoughts and opinions some of us might have had. The sheer honesty and the infusion of humor, plus the fact that there’s a character who apparently looks like Zac Efron (a win in any situation, really), was really great. While not perfect, it’s definitely worth the time.